New national st atistics have revealed that the Norfolk and Norwich University Hospital (NNUH) is the top performing acute teaching Trust in the whole country for staff flu vaccinations. 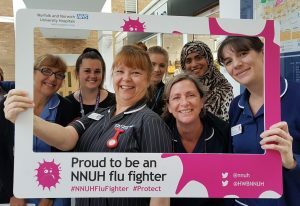 The hospital’s “Proud to be an NNUH Flu Fighter” campaign also saw the Trust ranked 4th out of all Trusts nationally, and achieving the most successful year on record for the Trust with more than 6,000 staff receiving the protective vaccination, representing over 80 per cent of staff . Hilary Winch, Head of Workplace Health, Safety and Wellbeing, said: “It is very satisfying to see the numbers of staff who took up the offer of the vaccine and have considered their professional responsibility. The fact that we have reached such a high level nationally is an amazing added bonus to the flu fighter team”. The campaign, headed by the Trust’s Workplace Health, Safety and Wellbeing team ran for five months from October but the planning started in early summer. Hilary stated: “This campaign involves not only members of my own team but many other teams in the hospital – it really is a joint effort to make sure all plans come together. The flu jab campaign had an amazing start back in October when 1,500 members of NNUH staff were vaccinated in just four days, and the numbers rose steadily week by week until the record total was reached in January.